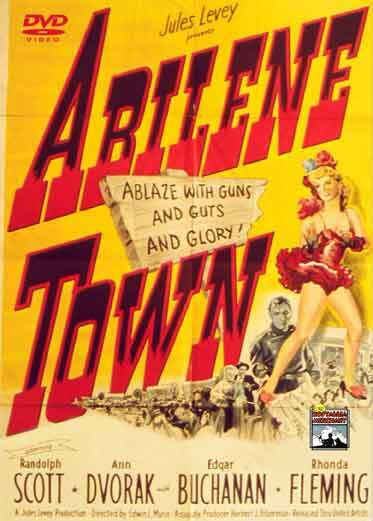 Abilene Town – In the years following the Civil War, the town of Abilene, Kansas is poised on the brink of an explosive confrontation. A line has been drawn down the center of the town where the homesteaders and the cattlemen have come to a very uneasy truce. The delicate peace is shattered when a group of new homesteaders lay down their stakes on the cattlemen’s side of town, upsetting the delicate balance that had existed thus far and sparking an all-out war between the farmers, who want the land tamed and property lines drawn, and the cowboys, who want the prairies to be open for their cattle to roam. Starring: Randolph Scott, Ann Dvorak, Edgar Buchanan, Rhonda Fleming, Lloyd Bridges – DVD, Digitally remastered. 1948 – BW – 89 Minutes.